The Flamingo Inn is located on Grassy Key, Mile Marker 59.3 on the gulf side approximately 7 miles north of the Marathon Airport. The goal of your hosts is to insure that you have a comfortable and pleasant stay. 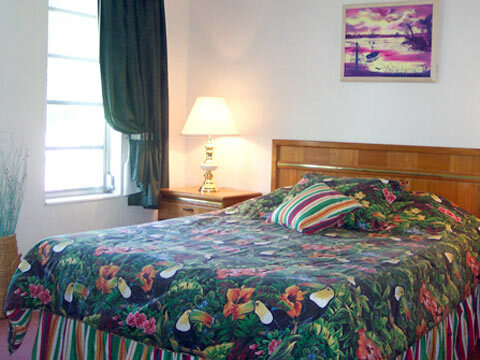 The Flamingo Inn has acquired a reputation from guests as being one of the cleanest motels in the Florida Keys We offer both motel rooms and 1 and 2 bedroom apartments with fully equipped kitchenettes. All units have: click on pictures to enlarge - Cable TV - Telephones with Dataports - Air Conditioning - Bright Tropical Decor So, come enjoy our flamingos, dolphins, parrots, fish, shells, and palm trees during your stay in the Fabulous Florida Keys. Our popular freshwater pool offers many hours of pleasure for you and your family! Relax in the Flamingo's backyard amid lush tropical foliage. Enjoy your dinner prepared on one of several BBQs on the property! Our complimentary boat ramp is located 100 yards down our side road. Also, nearby bridge fishing is world class.